Before plugging in maps manually, why not try out our easy to use Cinema 4D addon to quickly load in your materials? Do you love to pick apart materials to see how they work? If so then we have some sample material project files, pre-made to work correctly with some of the most popular renderers for Cinema 4D. In many cases you can even take these materials and simply replace the various maps with those of another material type and have them work instantly! 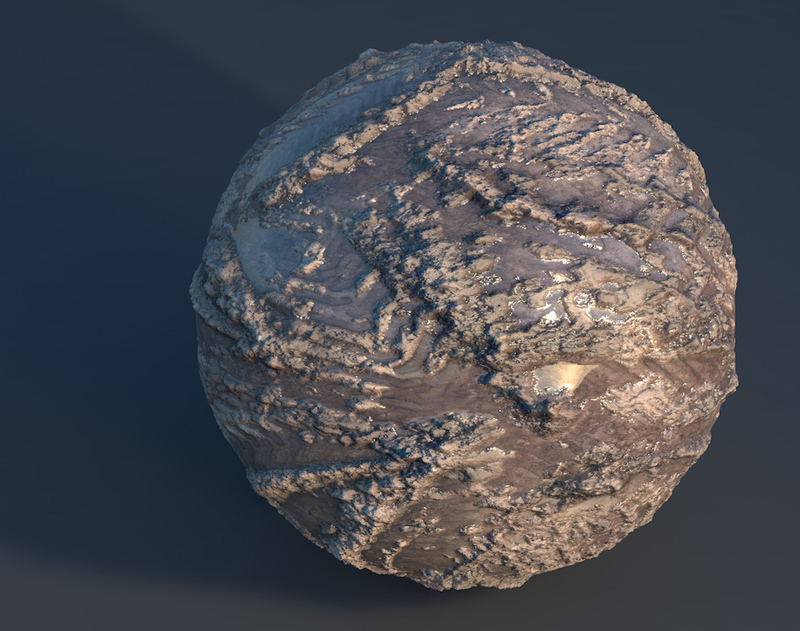 In these video tutorials you'll learn how to get the most out of your Poliigon textures with some quick and easy Cinema 4D Materials. A great in-depth video demonstrating how to use the Vray advanced material. 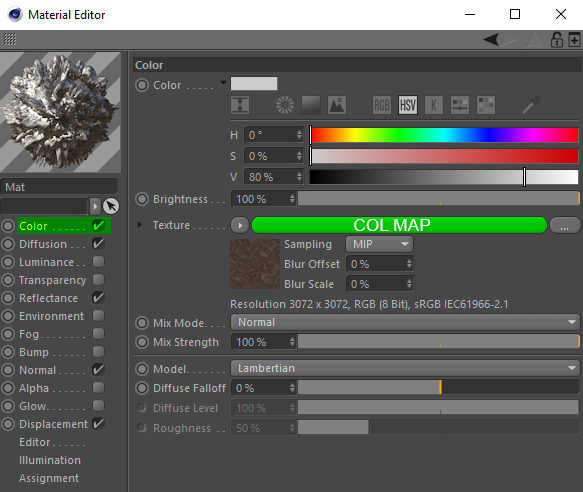 For the color just simply load the map into the 'Texture' input. 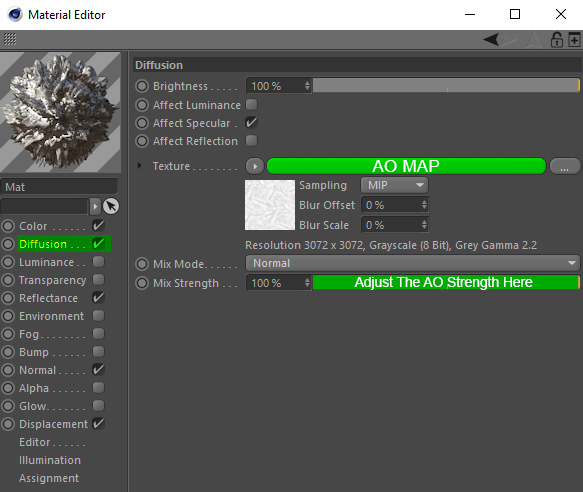 AO maps can be loaded into the 'Diffusion' channel and directly into the 'Texture' input. The only other thing you may wish to adjust is the 'Mix Strength' if you find the AO effect to be too strong. Also bear In mind that in order for the reflections to look correct when rendered, the 'Layer Fresnel' needs to be activated. Switch to 'Dielectric' mode and then adjust the IOR to an amount that looks right for your material. 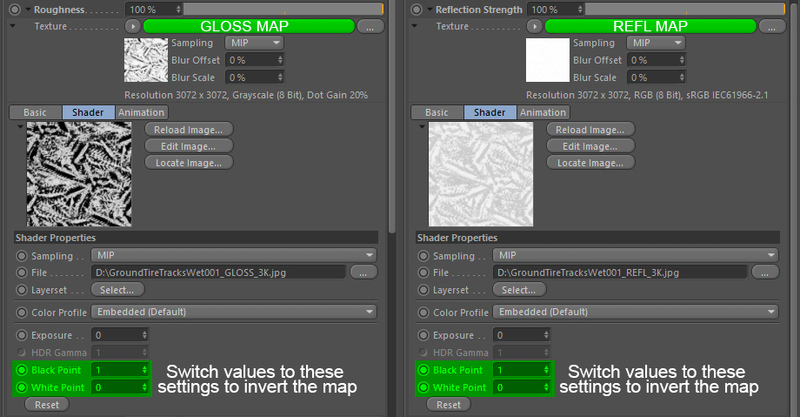 Another very important setting to get right for the Gloss and Reflection maps is to invert their values. There isn't a simple button to do this, however if you expand the arrow next to the 'Texture' inputs all you need to do is switch the values for the 'Black Point' and 'White Point.' This will effectively invert the maps so that they appear correctly at render time. For the normals just simply load the map into the 'Texture' input. 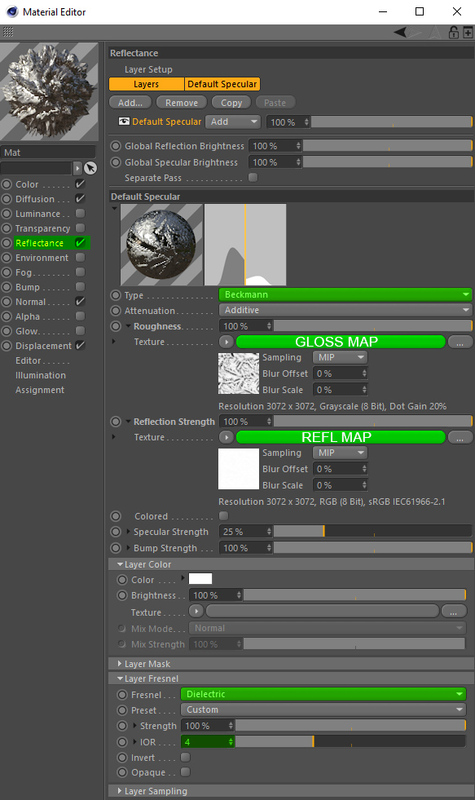 For the displacements just load the map into the 'Texture' input. 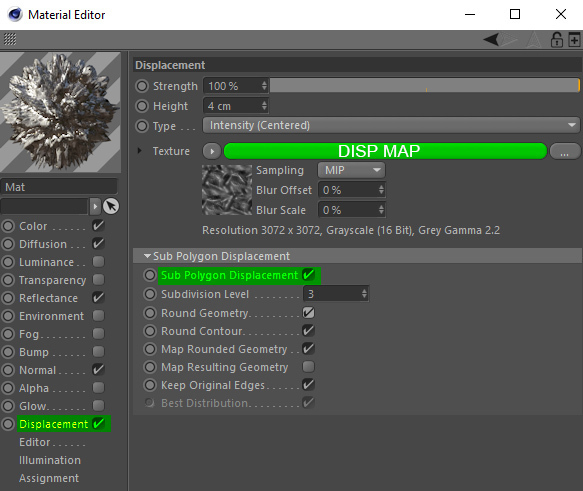 In order to get some nice high-detail subdivisions, enable the 'Sub Polygon Displacement' option and then customize the settings to fit your model. Cinema 4D has a very simple and effective method of adding overlay textures to your meshes. 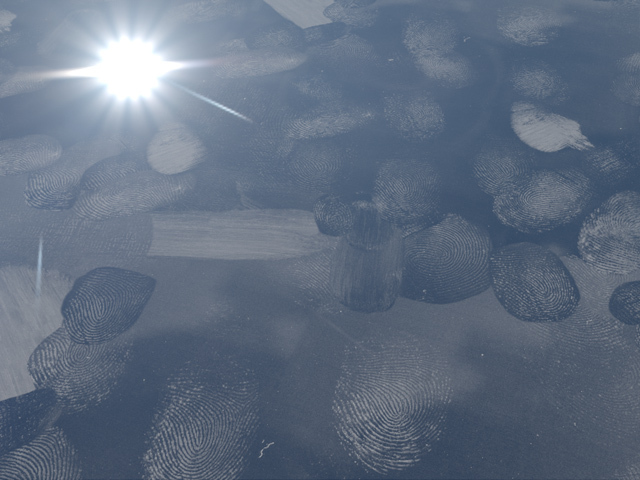 The trick to making overlays work is by creating two materials; your base material (which in this example is a simple glass material) and an overlay material which will be alpha masked on top of it. 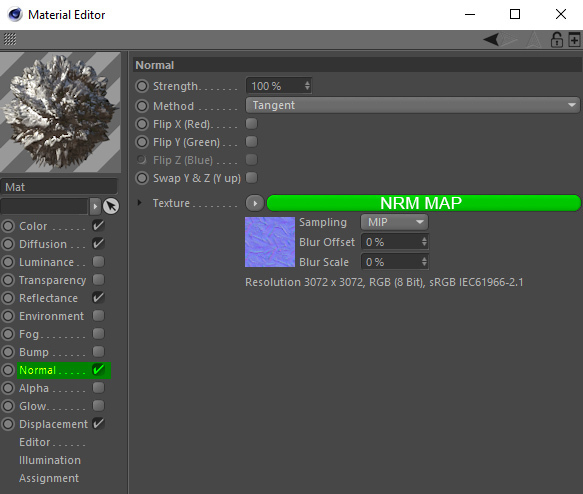 In this example below we can see the two materials used to create the above render. Also make certain that they are arranged in this order with the overlay material placed after the base material. 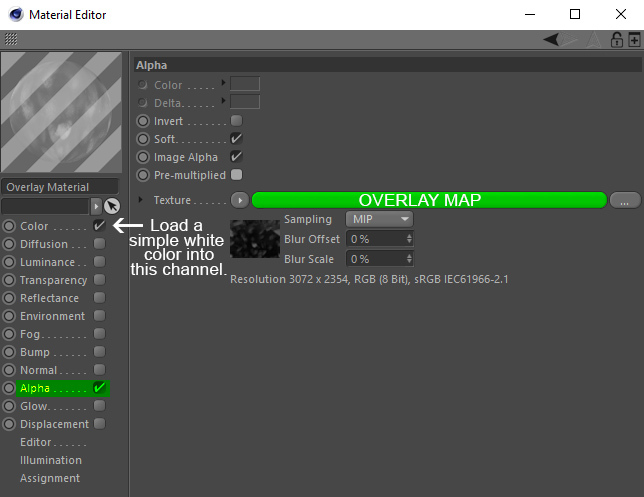 The overlay material is very simple to make, just use a simple white color in the 'Color' channel and then in the 'Alpha' channel insert your overlay map into the 'texture' input. Next just select both materials and drag them onto your mesh (plane) in the viewport. This will apply both materials to the mesh and as long as the overlay material is positioned after the base material, it will alpha mask on top and create a nice looking overlay. That's it!